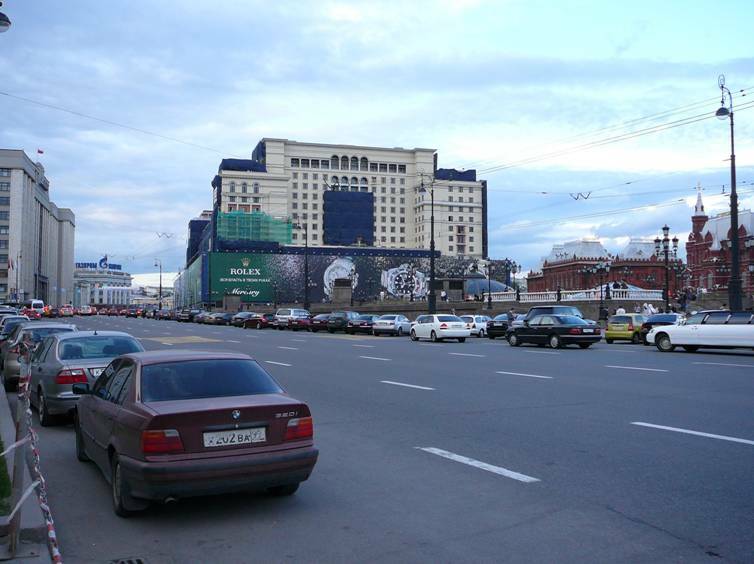 Zurab Tsereteli’s “Peter “, which set the new scale of urban development and in fact became a catalyst for regeneration of the historic environment of the Moscow center – is a deal well known and done long ago (1997). 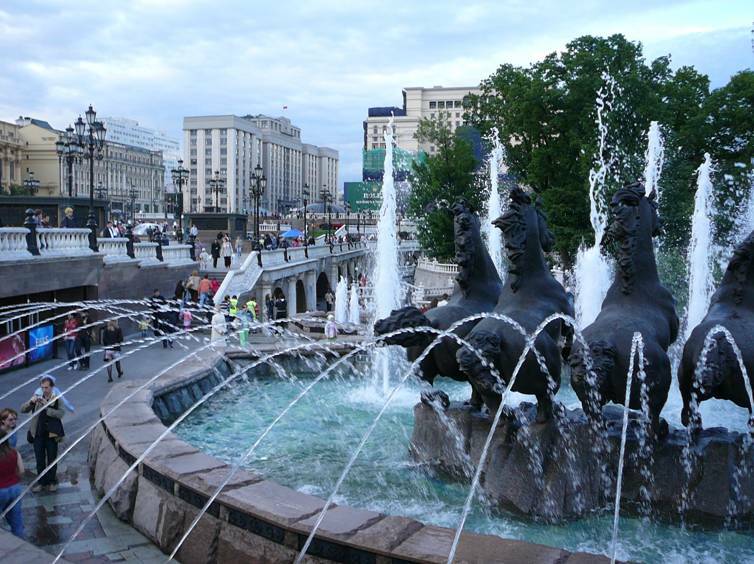 The transformation of Manege Square into the warren of passages, shops and Tsereteli’s sculptures also was done long ago (end 1990s). 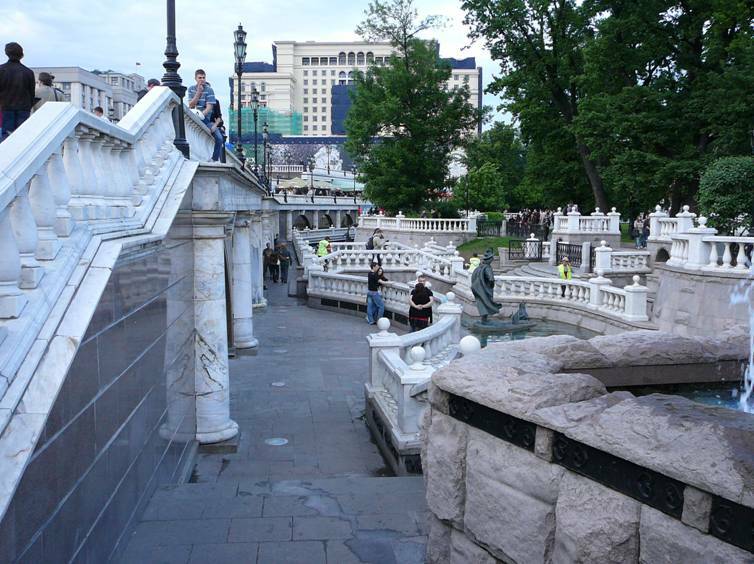 Shopping complex “Okhotny Ryad” (architect – Michael Posokhin Jr.), which together with the accomplishment of "adjacent territory" entered Alexander Garden, destroyed part of the historical fence essentially violated the solemn atmosphere around the Tomb of the Unknown Soldier . 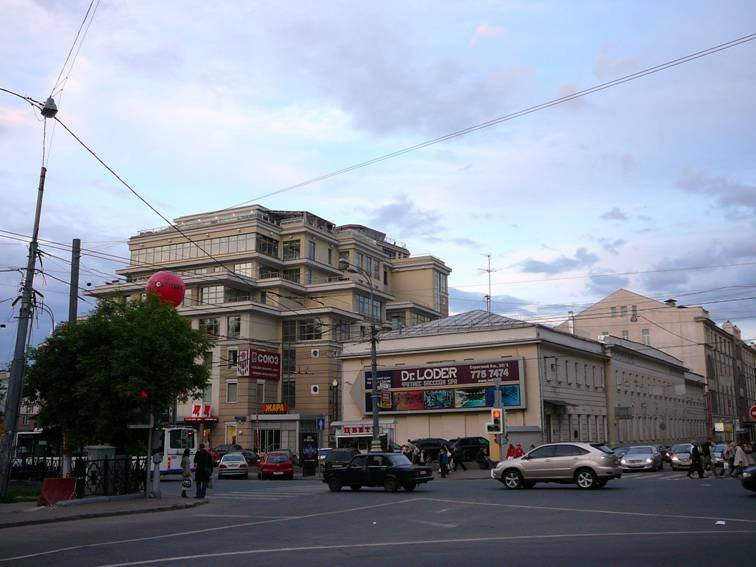 In the early 2000's Moscow authorities had a chance to remedy the situation at least partially: Moscow hotel, looming over Kremlin, was demolished (as inappropriate to modern hotel standards), and if at its place had remained the square, urban environment atmosphere around Kremlin would have been significantly improved. But the hotel brings more money, so it was lined up again (naturally, with more comfortable interiors). 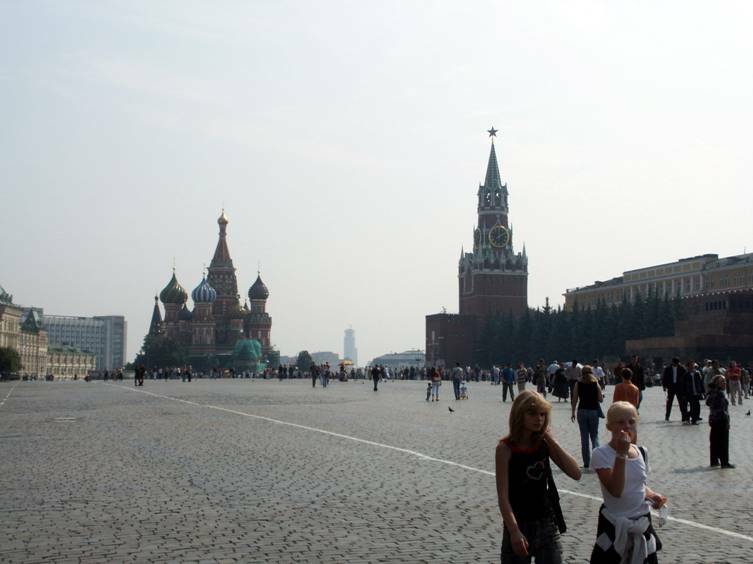 As a result the tough dummy now hangs above Kremlin. 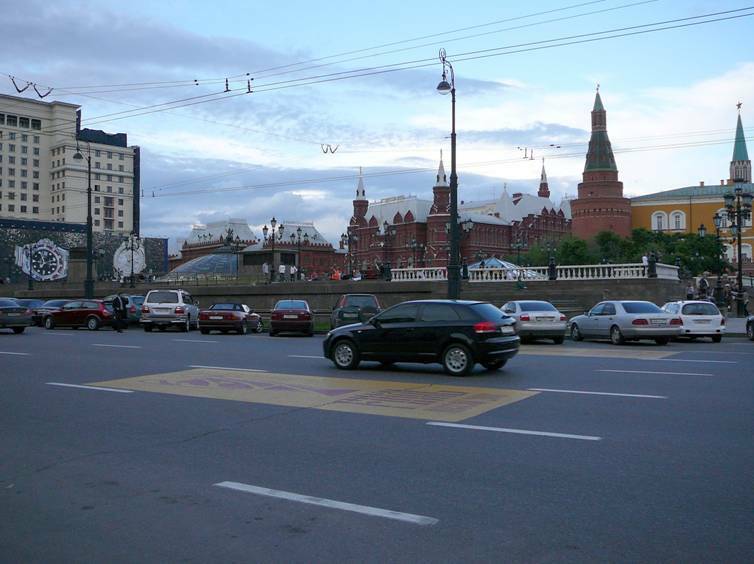 In the early 2000's Moscow Mayor Yuri Luzhkov asked Moscow City Council to assign to the artist Alexander Shilov the title of Honorary citizen of Moscow. 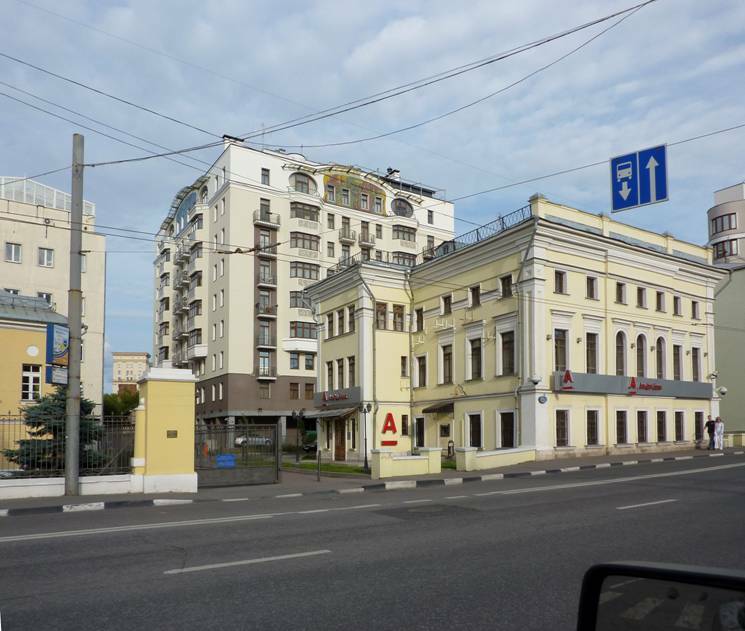 There was a lot of noise, Shilov did not get the title, but in the meantime construction of a new building for Shilov’s gallery "quietly" started. 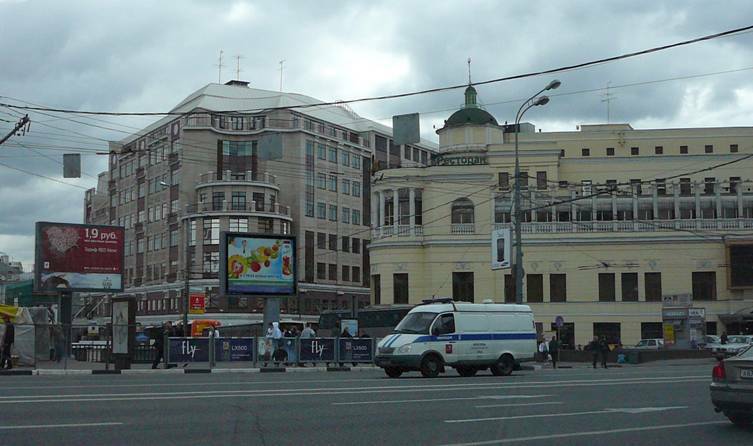 The building with a gross and eclectic facade, overlooking Kremlin and adjacent to Pashkov House (wing visible in the photo). And behind the gallery grew the "collateral" building – just as rough and eclectic. 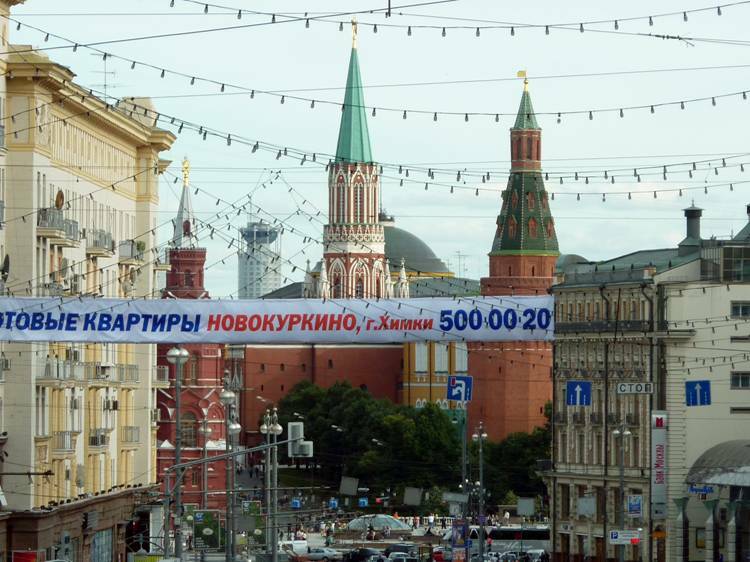 Advertising banners, hopefully, will be removed from the historical center. 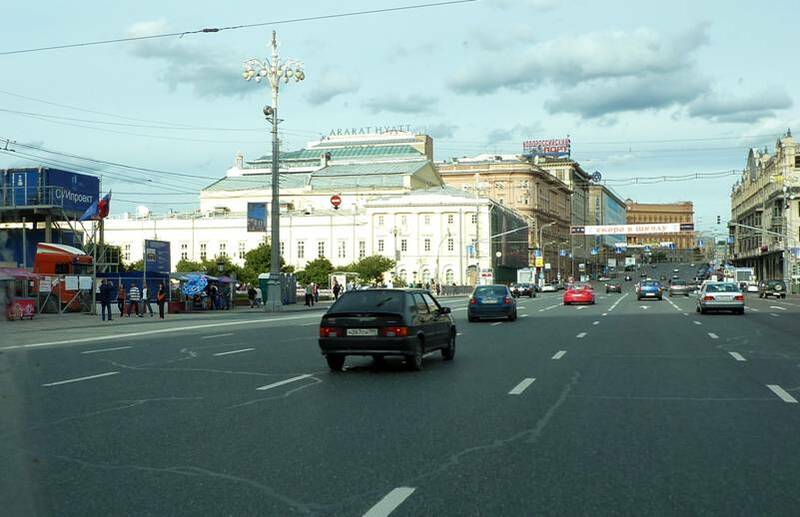 But "Red Hills" in any case will remain (a view at them from Tverskaya Street). 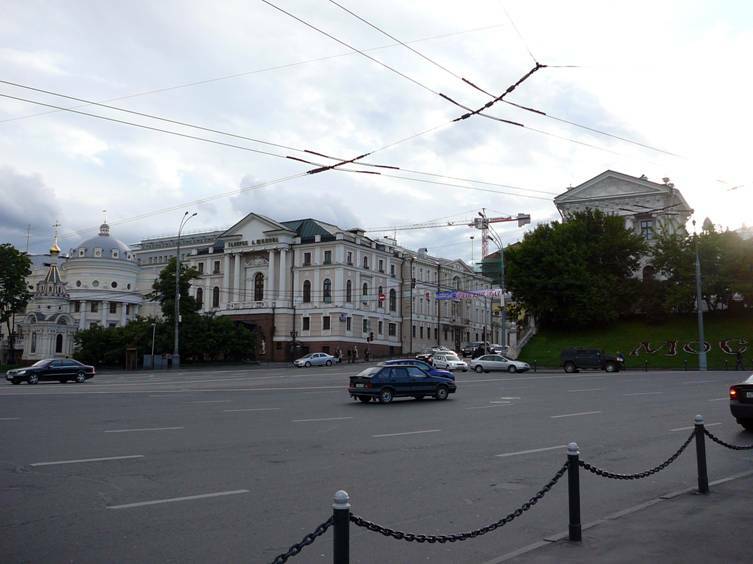 The similar situation is with the "tower" by architect Sergey Tkachenko at Paveletskaya square. All means are good to get the view from the windows to Kremlin. 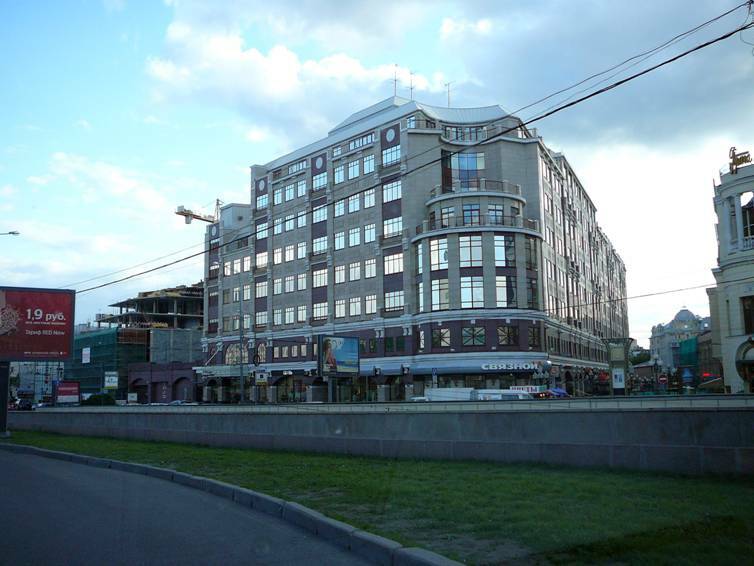 If one can not build a new high-rise building, lofts are constructed (pictured – the loft overlooking Alexander Garden). 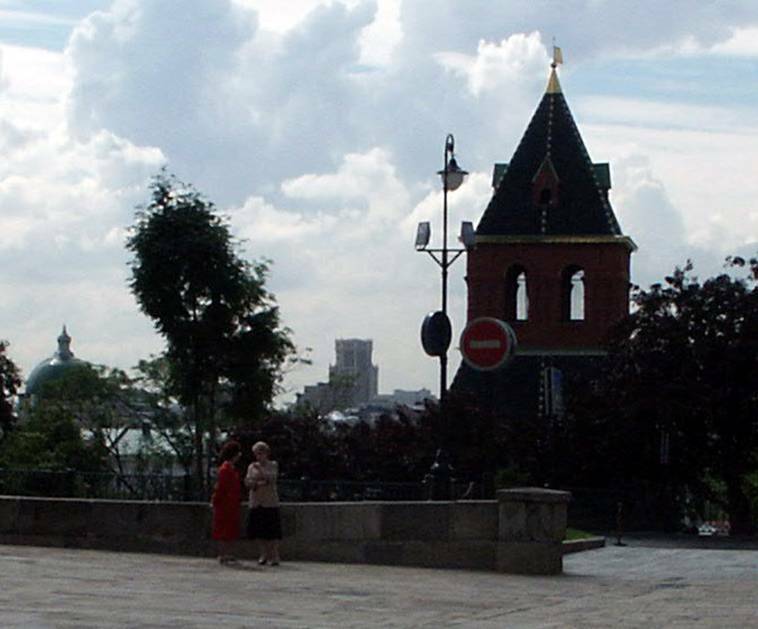 Formerly there was a full view at Kremlin from Pyatnitskaya and Bolshaya Ordynka streets. 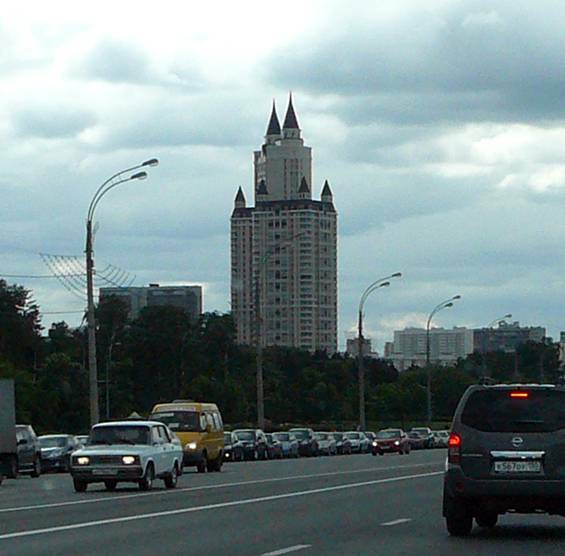 But in the early 2000's the business center "Tsarev Sad” was built (architect Alexei Vorontsov). 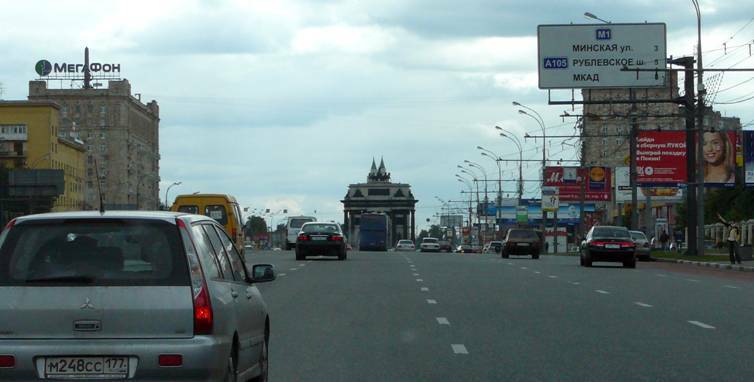 I wonder what enemies of Russia fitted "horns" to one of the symbols of military glory of the country – the Arc de Triomphe on Kutuzov Avenue? 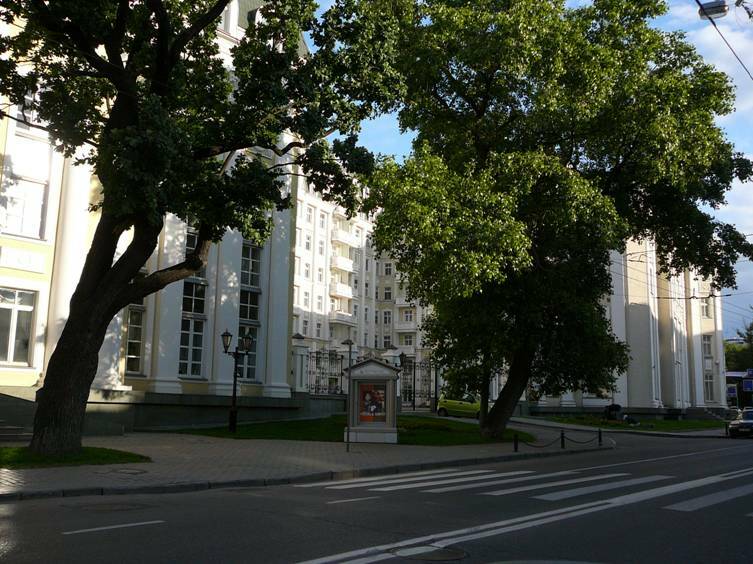 May be, those, who built luxury residential complex "Edelweiss" on Davydkovskaya street? Or those who have done a visual landscape analysis of its project? Or those who coordinated the draft and approved it? 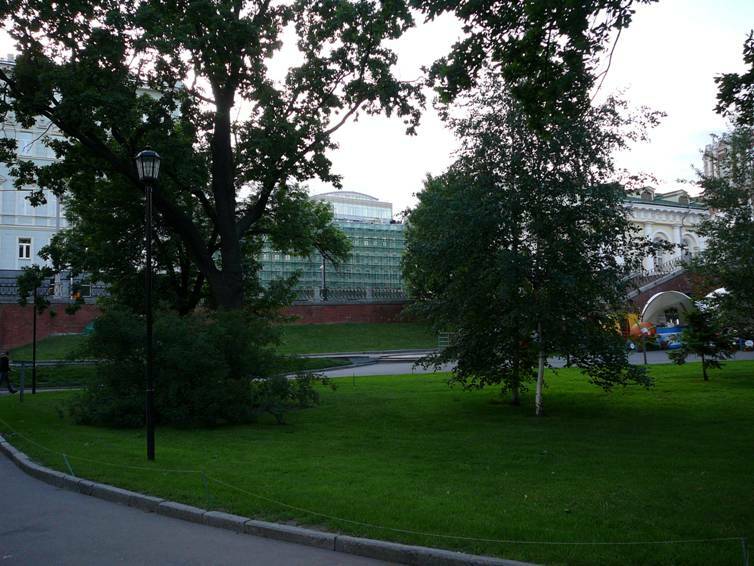 For many decades at the corner of Arbat street and Arbat Square there was a garden. 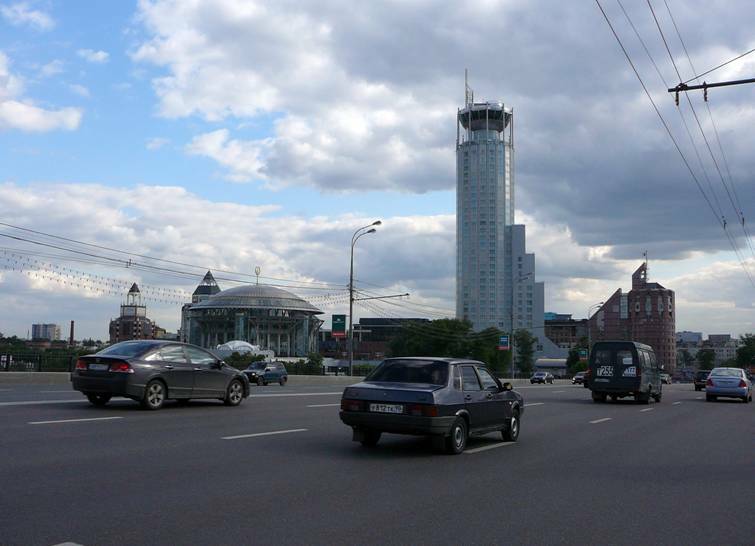 And that's there now (the business center called "Alfa-Arbat-Plaza", architect – Michael Posokhin Jr.). And near it – "crushed" restaurant "Prague", the former local high-altitude dominant. 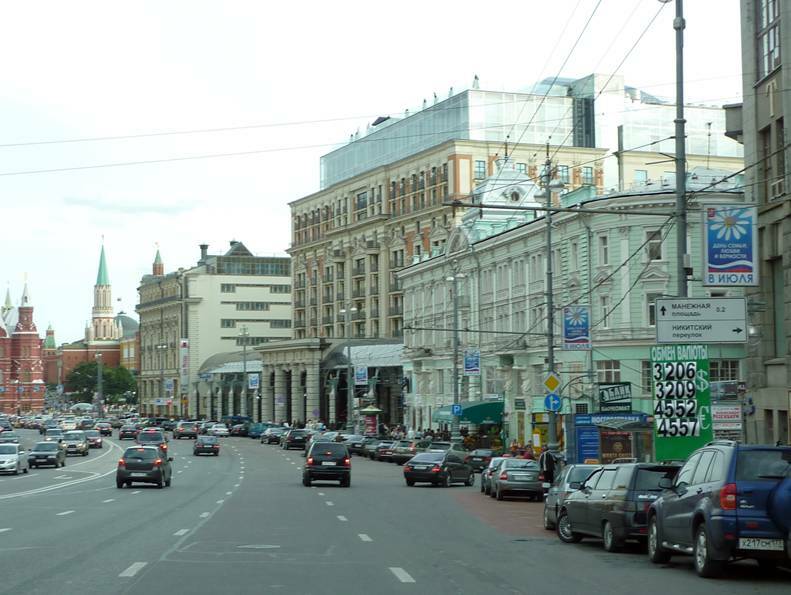 In the lanes of Arbat everything is about the same. 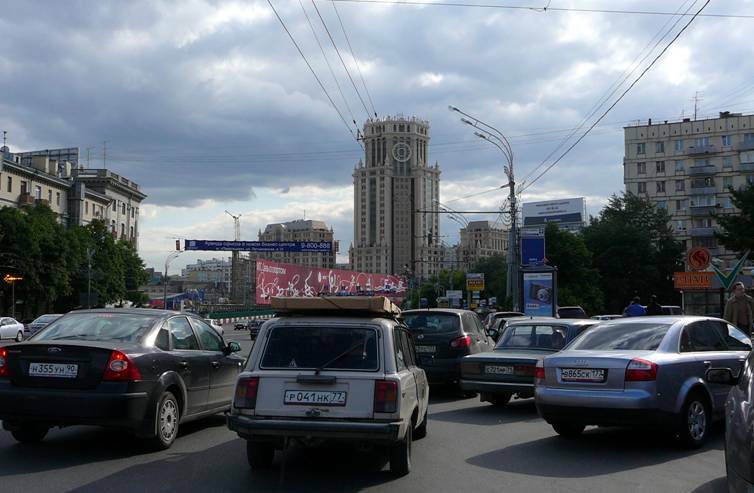 This is Philippovskiy pereulok. 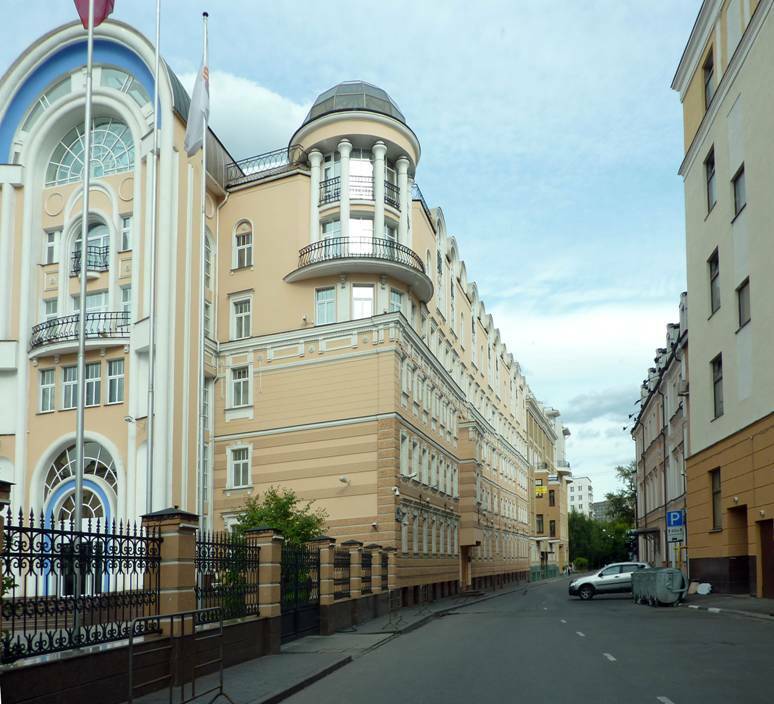 Between the Church of Athanasius and Cyril and the house in Art Nouveau style there is the huge building, occupying over half of the street, – office-residential complex "Dinaoda" (architect Sergei Skuratov). 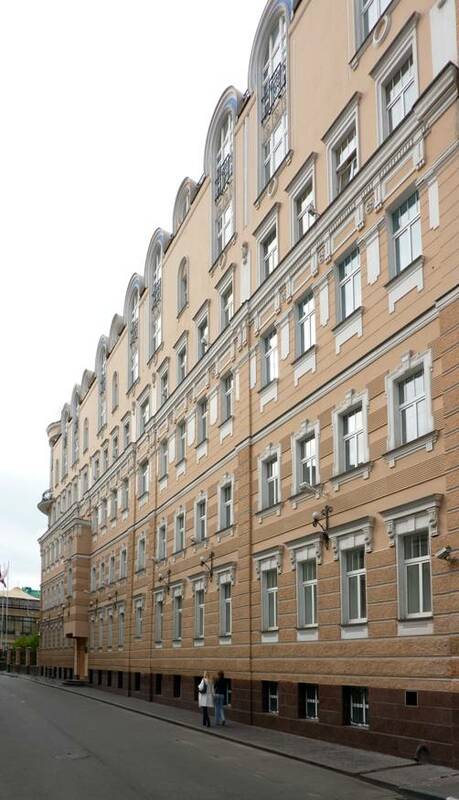 Actually, the name originally belonged to the rehabilitation center for disabled children, for whom the building was formally intended, when at the inception of the project it was necessary to justify its "social orientation". Since that time “Dinaoda”’s children with disabilities, of course, have disappeared (if they really existed). One might think that this is an elite residential complex somewhere in South Butovo. 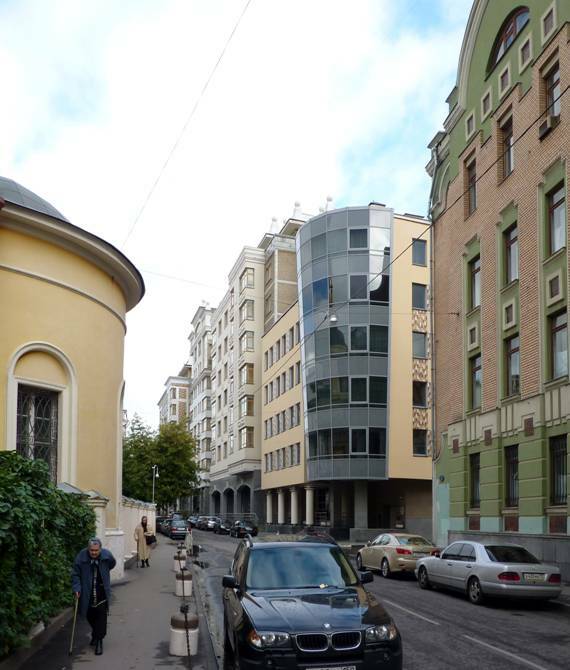 But this is so-called "School of Galina Vishnevskaya" (architect – Michael Posokhin Jr.) on old, narrow, once-charming Ostozhenka street. Many historical buildings are turned into rough imitations. 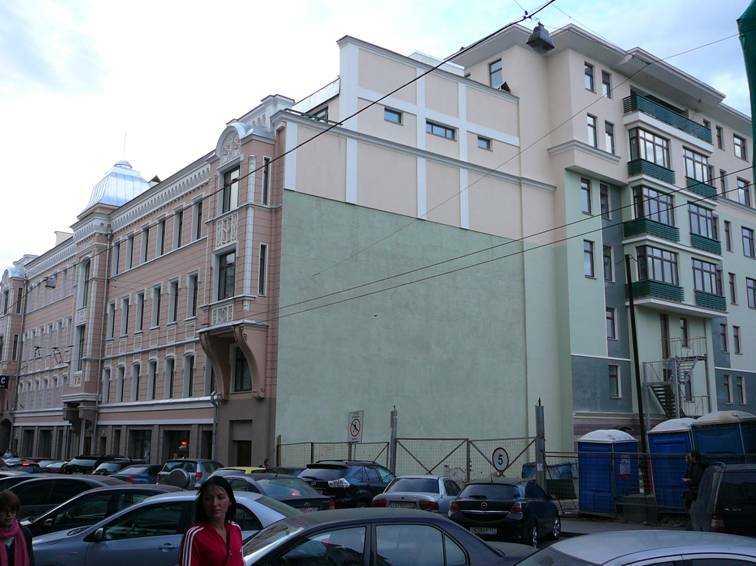 Dmitrovka, 14, is, so to speak, "the classic of the genre of imitations”: different facades are styled for different epochs. 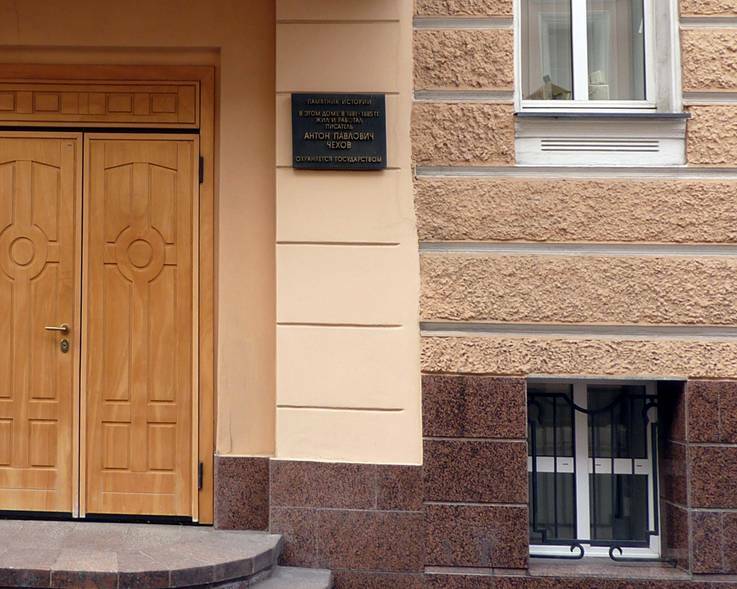 And here is a dummy built on Turgenev Square (Frolov Pereulok, 2 / 4). With the glass superstructure. 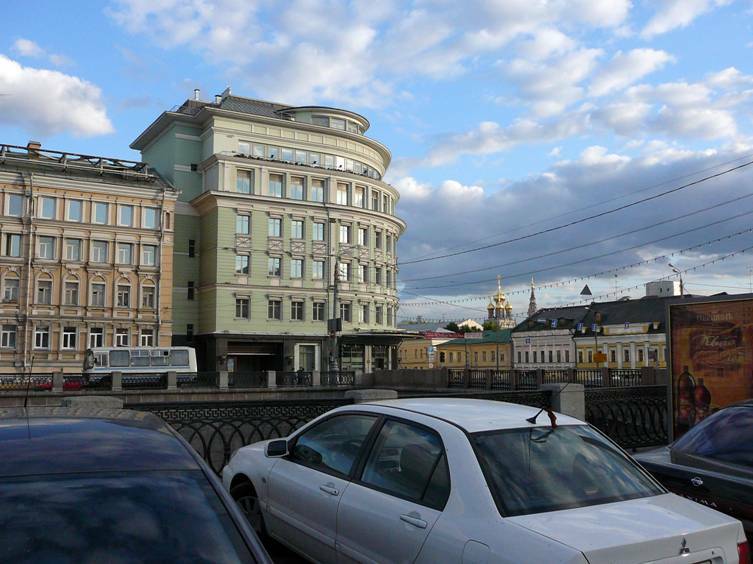 "The genre of imitations" is so infectious that in old-like style, but with the glass superstructure, the hotel «Ritz Carlton» was built (architect Andrew Meyerson) in place of the demolished hotel “Intourist”. 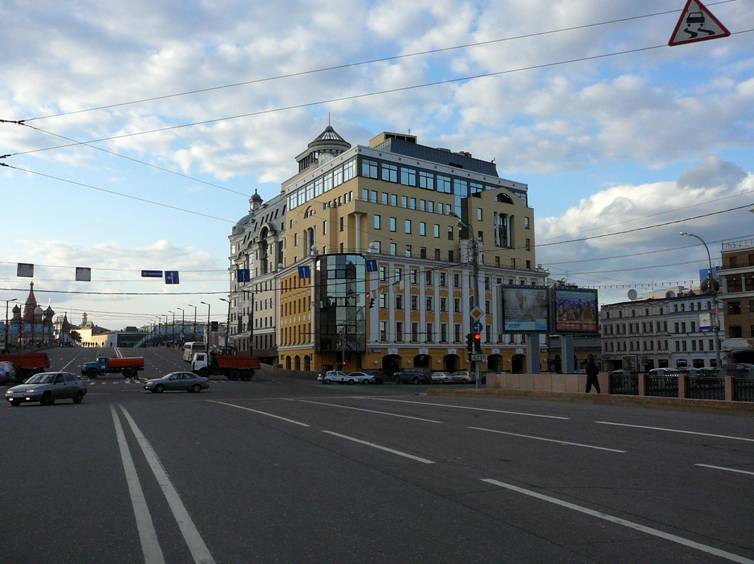 This plaster cast at the beginning of Bolshaya Ordynka it is even difficult to call an imitation, because the forms of the historical building are only slightly guessed in four lower floors. 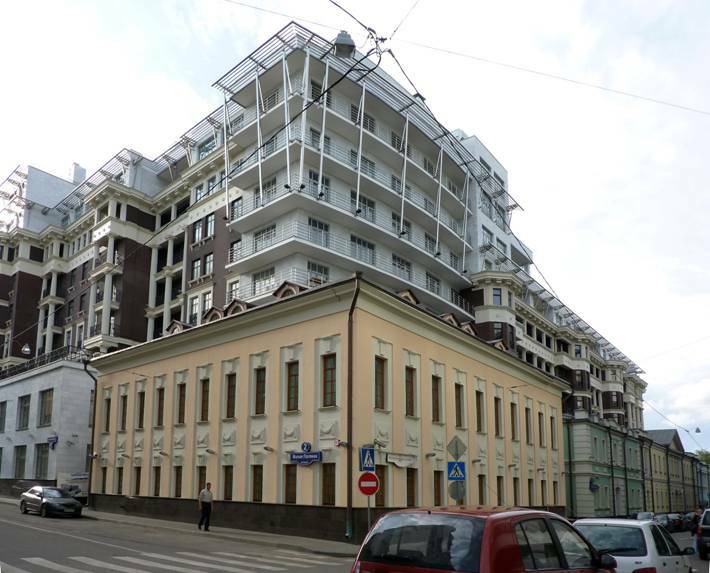 In this monster (Malaya Polyanka, 2, architectural workshop of Mikhail Leonov) the forms of historical buildings are met quite adequately, but the superstructure occupied the whole quarter. The disproportion between the scale and the discrepancy of styles, I think, is worthy of "Guinness World Records”. And all this is named "Onegin". 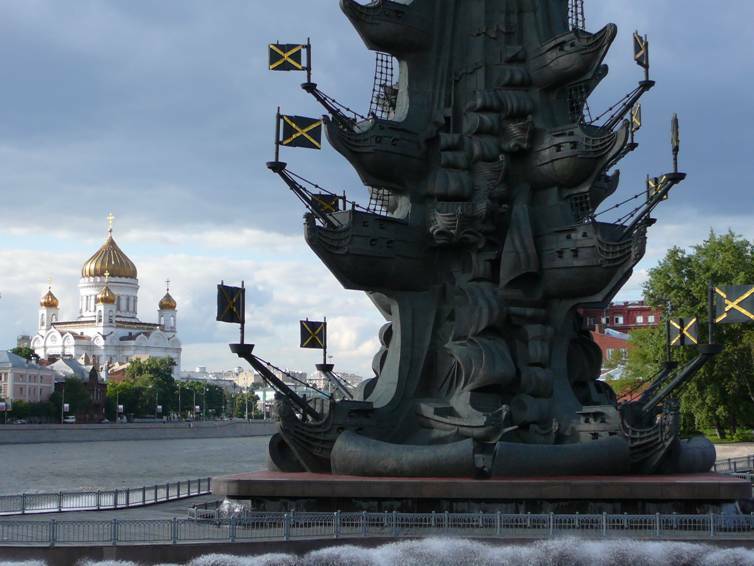 Apparently, in memory of the ruined building of Pushkin's time. 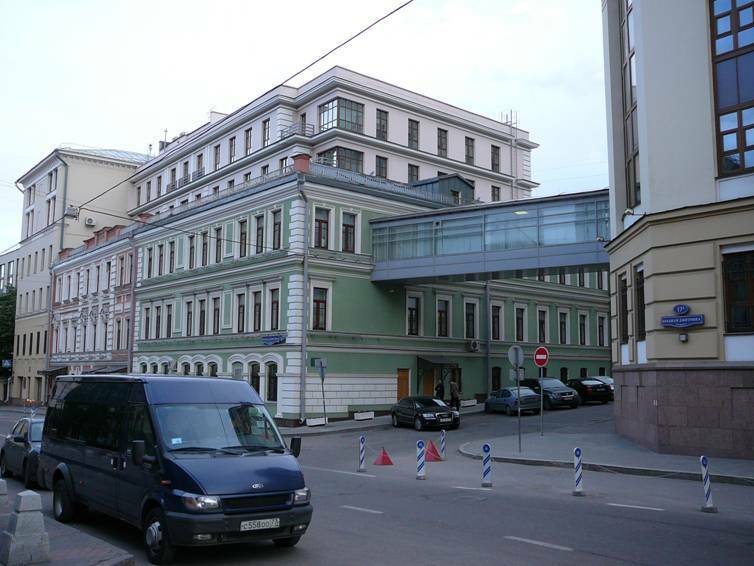 And this mutated beyond recognition dummy historic building (Maly Golovin per., 3) is not just a dummy, but with mockery. 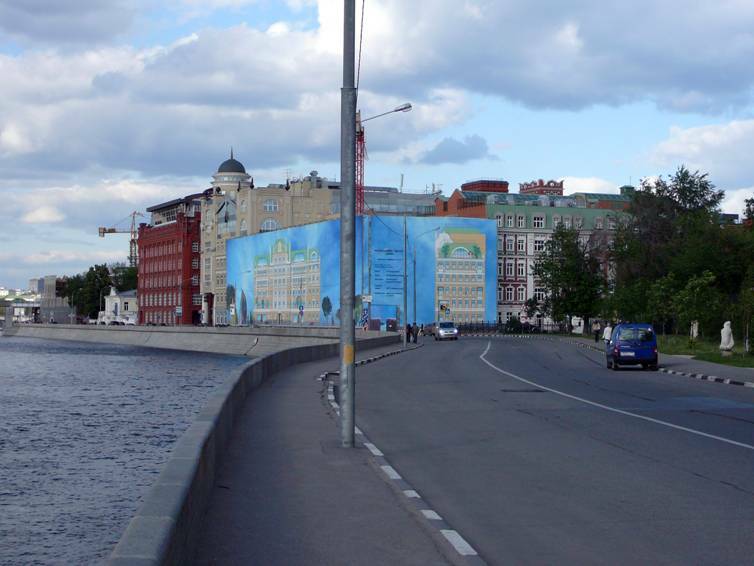 This is the whole quarter of conditional imitations, repeating the form of the old buildings only about – between Crimean Embankment and Yakimanka. The same quarter of imitations, so far from forms of old buildings, is located in the very beginning of Yakimanka. 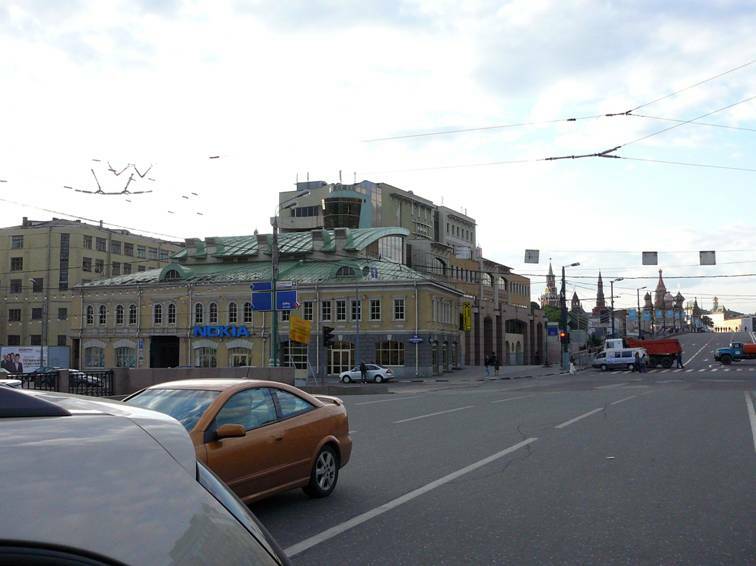 Most of the buildings were constructed by the already mentioned workshop of architect Mikhail Leonov. A new street somewhere in the notorious South Butovo? 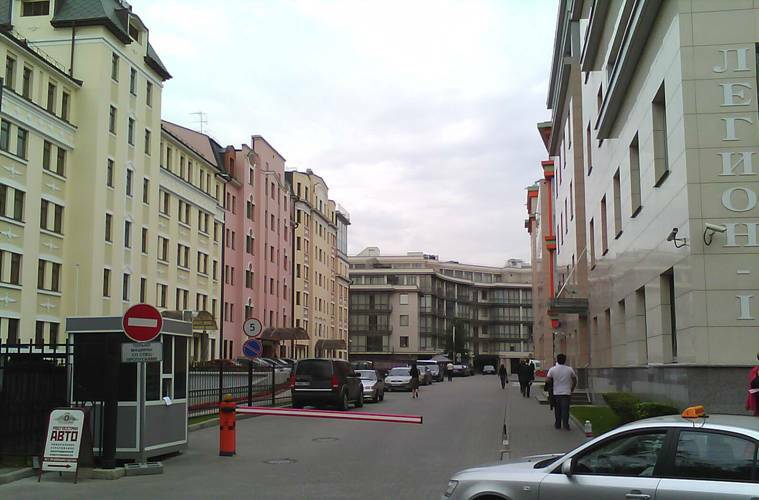 No, not a street and not in Butovo, but only three houses in the center of Moscow (Staromonetny per., 33, 33A and 35) and the passage between them. Such a scale. 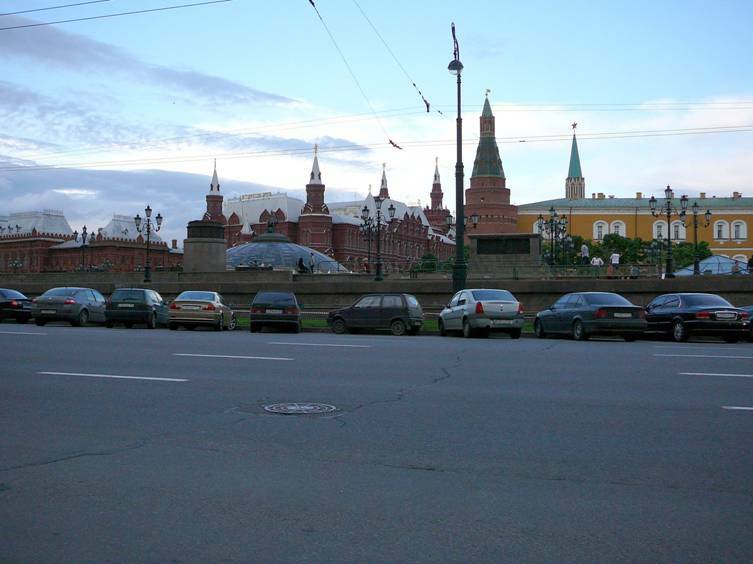 Photo was done "under the table" by the mobile phone, because the police guard prevents shoot a subject even from a distance, referring to the fact that some "high-ranking officials of Russian Federation live in these houses. Well, let’s be consoled by the fact that the old lane near Polyanka was disfigured not by any dealers, but by high-ranking and official persons. Another bitter, but symbolic nonsense: this multi-remake of an elite fitness center «Dr. 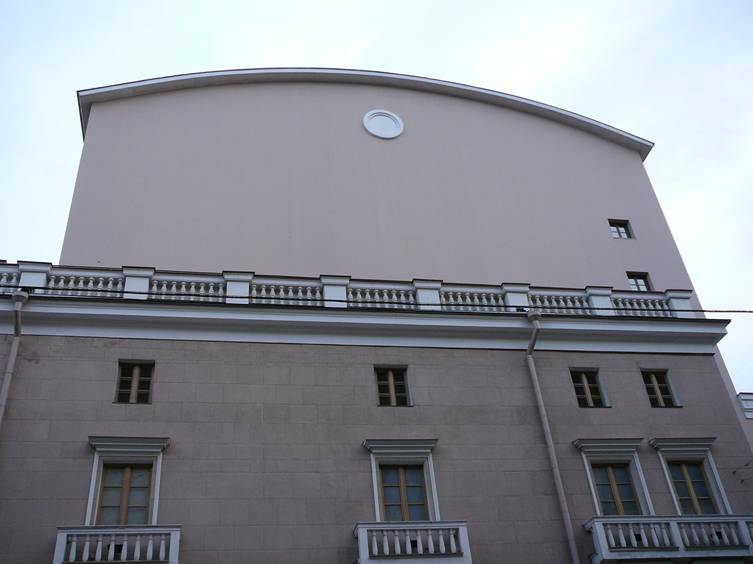 Loder» in place of historical building of XVII century (Strastnoy Boulevard, 10, architect – Pavel Andreev under the overall leadership of Michael Posokhin) belongs to... the Union of theatrical figures of Russia.